Italy, 1938. One man rises to power: Benito Mussolini. Among the Italian dictator's many schemes, was his plan to eradicate gay men from Italy. The law did not admit their existence, so they were condemned without trial as prisoners on remote islands. On San Domino, the exiles turned the island into a fascist gay paradise because they did not have to hide their sexuality any more. The musical drama San Domino, focuses on the intersection of the relationships of these gay men: the drag queen, the young one, the English man, the priest, the lawyer — an excellent performance from Matthew Hendrickson — the (rather out of place) straight guy, and more. The play is a mixed bag: songs are catchy but not lastingly memorable, only Talking Together stands out from the pack. Characters' backgrounds are unexplained, and the dialogue gives them no depth: San Domino is an episodic account of events — most of them violent — and this limits the emotional exchanges. 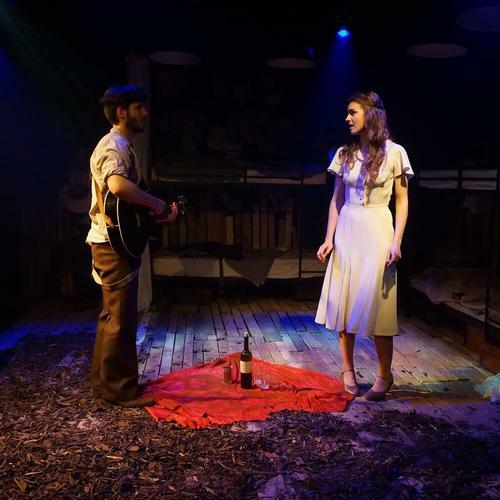 The Tristan Bates is a intimate venue which suits the show, although the stage can get a bit crowded at times, but this is an intelligent concept reflecting a tragic time in Italy's history. San Domino, Tristan Bates Theatre, Tower Street, WC2H 9NP, £17.50. Until 17 June.